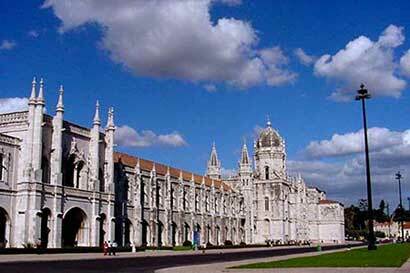 The Department of Mathematics of Instituto Superior Técnico (IST), Lisbon, in collaboration with the International School for Advanced Studies (SISSA) in Trieste, is organizing the 2004 Workshop on Algebraic Geometry and Physics, that will take place in Lisbon, Portugal, from Tuesday 7 to Sunday 12, September 2004. This event is part of a series of workshops and schools organized since 1996 by SISSA in collaboration with other institutions. Topics covered will include recent interface between matrix models, integrable systems and algebraic geometry. Sheldon Katz (University of Illinois) "ADE geometry and dualities"
Marcos Mariño (CERN, Geneve & Instituto Superior Técnico, Lisbon) "Topological strings on Calabi-Yau geometries, integrable hierarchies and matrix models"
Rahul Pandharipande (Princeton University) "Gromov-Witten theory in low dimensions"
Pierre van Moerbeke (Louvain University & Clay Mathematical Institute) "Random permutations, random matrices and integrable systems"
Ettore Aldrovandi (Florida State University) "Hermitian-holomorphic 2-gerbes and tame symbols"
Bjorn Andreas (Humboldt Universitaet, Berlin) "G-flux and Calabi-Yau geometries"
Claudio Bartocci (Università degli Studi di Genova) "Special Kaehler geometry of classical integrable systems"
Alexander Braverman (Harvard University) "Instanton counting via affine Lie algebras"
Ron Donagi (University of Pennsylvania) "The particle spectrum of heterotic compactifications"
Boris Dubrovin (SISSA, Trieste) "Frobenius manifolds and matrix models"
Francesco Fucito (INFN, Universita' di Roma II) "Non perturbative computations in supersymmetric theories"
Lothar Goettsche (ICTP) "Instanton counting and Donaldson invariants"
Daniel Grunberg (Max Planck Institute, Bonn) "Gromow-Witten potentials and automorphic forms"
Bernd Kreussler (Mary Immaculate College, Limerick) "Semi-stable sheaves on nodal cubics"
Alexei Morozov (ITEP, Moscow) "Matrix models partition functions and string theory"
Motohico Mulase (University of California, Davis) "Symplectic geometry of the moduli space of pointed algebraic curves"
Nikita Nekrasov (IHES, France) "Chasing topological M-theory"
Tony Pantev (University of Pennsylvania) "Heterotic compactifications with fluxes"
Claudio Pedrini (Università degli Studi di Genova) "Finite dimensional motives and the conjectures of Bloch and Beilinson"
Rene Reinbacher (Rutgers University) "Moduli dependent spectra of heterotic compactifications"
Emanuel Scheidegger (Institute for Theoretical Physics, Vienna) "Higher genus topological string amplitudes"
Sergei Shadrin (Independent Univ. of Moscow and Stockholm Univ.) "Getzler's relation in dGBV-algebras"
The Conference dinner will take place on September 9, 20h00, in Hotel Tivoli Tejo near the underground station Oriente (red line). There will be a fee of 100 Euros (150 Euros for registrations submitted after May 1st) to be paid in cash upon arrival. The Symposium will be held in the room PA1 in floor -1 of the Mathematics Department Building (#5 on the left top corner of the campus map) at the IST - Instituto Superior Técnico. 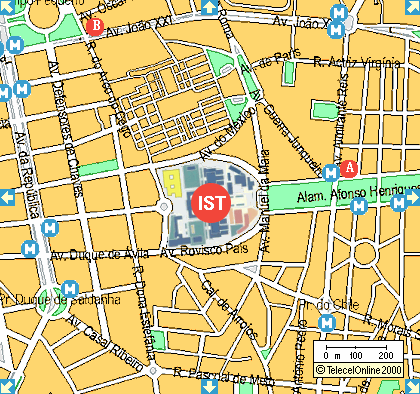 As you can see on the map, Instituto Superior Técnico (IST) is located near Alameda Afonso Henriques. The campus in this map is rotated in 90º with respect to the campus map above. The closest underground stations are Saldanha and Alameda. 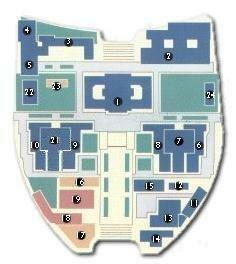 The entrance facing Alameda on the campus map is the one between #17 and #14 on the map above. 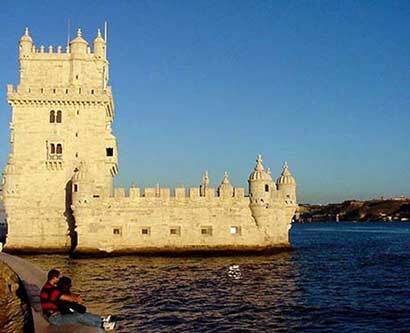 Hotel AS Lisboa is marked with an "A" and Hotel Alif with a "B" on the map on your right. Participants of WAGP2004 are welcome to stay for these courses. In case you do want to attend them please say so in your hotel reservation. Double Room (to share): 61.53 Euros. The Hotel is close to the conference venue (5 minutes walk). The Hotel is close to the conference venue (10 minutes walk). Center for Mathematical Analysis, Geometry, and Dynamical Systems. Center for Mathematics and its Applications. Fundação para a Ciência e Tecnologia. Project Moduli Spaces, Integrability and String Theory, POCTI/MAT/33943/99. Project String Theory in Curved Space, POCTI/FNU/38004/2001.